The surf school Aloha is labeled French surf school, all our lessons of 1h30, are provided by instructors holders of the State Patent of Surf Educator Sports and Lifeguards. We choose with you the place and we determine the best times to go surfing. The equipment provided during the courses (boards and suits), is specially designed to enhance learning. It is related to your size and your level of practice. It will evolve as you progress. In general, times of low tide offer all the guarantees necessary for the proper conduct of surf and bodyboarding courses. During your training, topics such as: tides, streams, wave formation, the weather … will also be discussed. Feel free to ask questions, be curious! Listening to young and older, the monitor by its personalized service , will enable every one to his rhythm, find his waves. Let the adventure begin !!! For young children who dream to discover surfing. For the smallest of us , especially the ocean and the waves can be impressive . Yet the desire to play and slide into the water is there. Discover our surf lessons for teens and adults in the Landes. From 12 years and no age limit , it is the learning to slide and exploring the ocean. Discover our surf lessons between Hossegor and Seignosse in the Landes for young children who dream to discover surfing. For the smallest of us , especially the ocean and the waves can be impressive . Yet the desire to play and slip into the water is there. It is therefore important to provide a safe environment , appropriate to their age and their motivations. In 1:30, six young surfers aged 6 to 11 supervised by a holder monitor patent of State Educator of Surf will play and grow in a selected area and secured by the monitor. In this space, they will still walk . Equipped with boards and combinations tailored to their size , they will discover the first sensations of surfing. While having fun they are also and especially learn how to evolve in the ocean and how to deal with the current and Landes’ waves. Discover our surf lessons for teens and adults in the Landes. 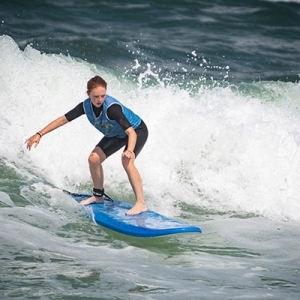 From 12 years and no age limit, it is the learning of surfing and exploring the ocean. Know how to equip, spend the first waves of the edge and use that energy to go back to the beach, first lying down and then standing on his board. Understanding the impact of tides and know how to use current. Keep standing on a wave of less than one meter as long as possible and of course … Enjoy yourself! Your playground? The wild beaches of Hossegor and Seignosse the Bourdaines! During 1h30 group of six surfers supervised by a Surf instructor, you will go off towards the line up : waiting area to take waves. Take off on waves that have not yet broken. Taking direction on a wave.